Medium and heavy weight fabrics are fully lined with New Dimension Dimout, faAB Ultra BlackOut and Soft & Subtle BlackOut. These three linings represent the latest technology and have been expertly matched to add features that complement the content of the face fabric of the drapery. Lightweight fabrics are left unlined in order to maintain the softness and sheerness of the fabric, and to allow diffused light to penetrate through the drapery. New Dimension Dimout: Exceptionally soft and light-weigth 90% Polyester/10% Cotton lining with an acrylic coating. faAB Ultra BlackOut: a soft lining with 100% Acrylic on the face and a 100% Cotton flannel backing. Superior light, temperature and moisture control. Soft & Subtle BlackOut: This high tech, light-weight lining offers enhanced drapability along with full black out capabilities. 100% Polyester, Acrylic coated. 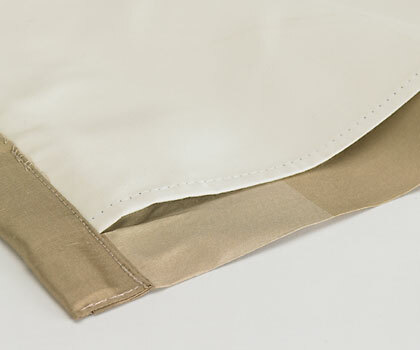 Each faAB-u-Luxe drapery includes a two-part lining. A Thermosoft 3-pass Blackout lining and a 7oz. interlining between the decorative face fabric and the Blackout lining. Never place an iron directly on the lining. The acrylic coating on the face of the composite fabric may be adversely affected by the application of direct heat. Dry Clean Only! Bring the content of the face fabric and the lining content to the attention of your cleaning professional. Care must be taken to avoid the possibility of damaging the face fabric and/or the lining. Lining offers insulation properties against cold, heat, sound and damaging UV rays. Plus, faAB's three grades of lining provide varying degrees of room darkening properties and light control. In all cases, the lining adds weight and body to the panel which gives the drapery a more luxurious look and feel. Over time, all fabrics can fade. Natural fibres like Silks, Linens and 100% Cottons, have inherently delicate qualities. As such, they are more susceptible to damage so lining is a necessary and standard feature. But, regardless of content, all draperies benefit from the addition of lining as it reduces sun damage and fading.